One of world cinema’s most prolific auteurs, François Ozon (Swimming Pool, In the House) returns with the moving and poetic period drama Frantz, an elegant reimagining of the story behind Ernst Lubitsch’s undersung 1932 drama Broken Lullaby. In a small German town in 1919, Anna mourns every day at the grave of her fiancé, Frantz, who was killed in battle during World War I. One day she spies a mysterious young Frenchman, Adrien, also laying flowers at the grave. Together they begin to bond over their shared grief, though Anna is intrigued by the enigmatic nature of Adrien’s relationship with her fiancé. As the pair become increasingly close, long buried secrets are revealed that will change the fabric of their lives and take them across a wearied and battle-scarred Europe. 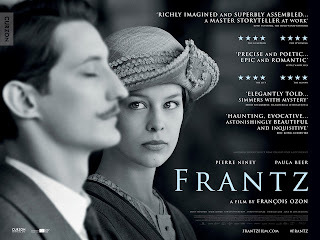 Frantz opens in cinemas & Curzon Home Cinema on 12 May.